At this point you've built the product form with all the required form elements including buttons to invoke the actions. Now, the next step is to configure the visibility and editability for the buttons -- "Add Product", "Make Active" and "Make Inactive" -- depending on the workflow states and data model references. In this section, we will configure the permissions for "Add Product" button. Where is the "Add Product" button placed in the product form? 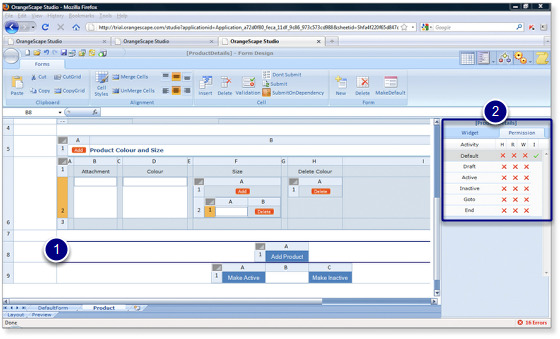 In the screen capture shown below, it can be observed that a 1X1 grid has been inserted in the cell (B8) in the form page. 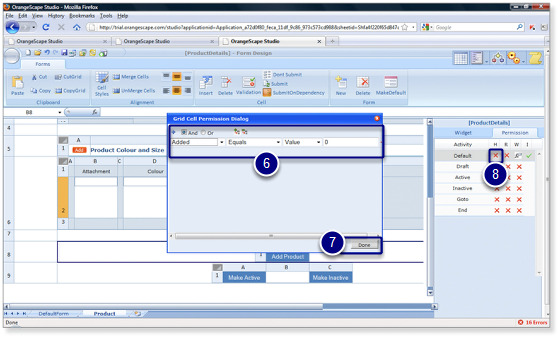 The "Add Product" button has been inserted in the cell (A1) in the 1x1 grid. There are two ways of specifying the permissions for the "Add product" button. In both the above cases, we are applying permissions to a cell. However, the first option is referred to as grid permissions, while the second option is referred to as cell permissions. But why? 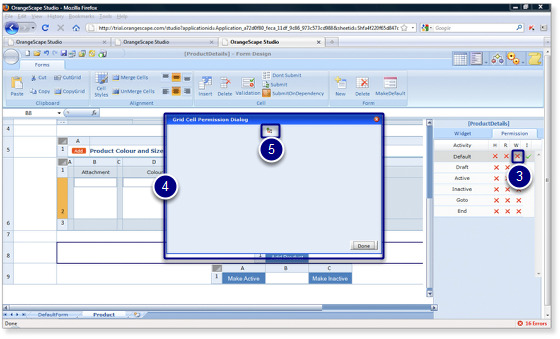 In the first case, since the cell contains a grid, the permissions are applied for the grid. Hence, it is referred to as grid permissions. 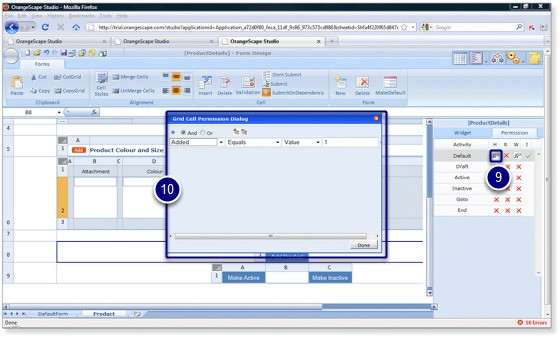 In the second case, since the cell contains a single form element, the permissions are applied to the form element contained in the cell. Hence, it is referred to as cell permissions. Select the grid as shown in the screen capture. Click on the "X" mark below "Write" to enable permissions for the default activity. "fx" formula button will now be displayed for "Write". Click on the "fx" formula button for write. Fourth parameter: Enter the value as "0". Similarly, let's define the hide permissions. Click on the "X" mark below "Hide" to enable permissions for default activity. "fx" formula button will now be displayed for "Hide". Click on the "fx" formula button. Specifying permissions for "Make Active" and "Make Inactive" buttons.